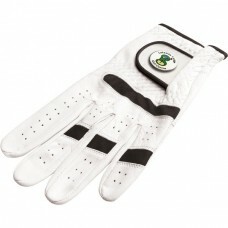 The quality Cabretta white leather golf glove makes a great promotional gift for any golf lover. It comes with a Magnetic ball marker and can be printed with your corporate logo or message up to 4 colours. Prices are based on a 1 colour print to 1 position. The colours shown are only for guidance and cannot be taken as a true representation. Minimum order is 50 off. If the artwork is more than one colour please call our sales team on 0191 420 2061 or email to get a quote. Copyright Mick Martin Promotions Ltd © 2019. VAT Registered: #654172342.